The KappoBike cycling app for Android and iOS tracks rides and encourages cycling with a fun leader board of app users—and sells aggregate data to city authorities to help them plan and improve cycling facilities. That could be good news all around, because research has repeatedly shown that more cyclists on the road are associated with improved cyclist safety. 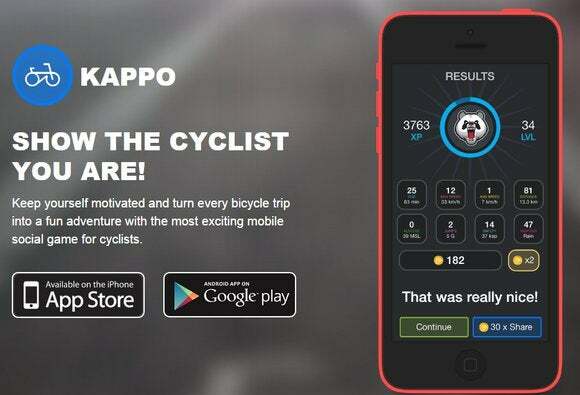 By turning cycling into a game, KappoBike aims to attract new cyclists hoping to make their daily commutes more fun, rather than just leisure and sports cyclists. There are plenty of other ride-tracking apps out there. While Strava, one of the better-established, plays it straight, tracking the actual speed and distance ridden, Kappo adds a fun twist by allowing riders to earn points for altitude climbed and jumps made, or for riding in bad weather, and to use these points to purchase faster in-game bikes or superpowers that further multiply the points earned. All this gives even relatively unfit cyclists a chance to augment their in-game performance through astute use of the power-ups and to climb the KappoBike leader board. The app is still in beta testing, but future versions could add “missions” to earn extra points by taking detours or visiting new places, Kappobike co-founder and CEO Iván Páez Mora said Thursday at LeWeb, an innovation conference in Paris where the company is one of the finalists in the startup competition. KappoBike is up front about what it plans to do with the data it gathers, selling it to city authorities to mine for information about where cyclists go and where more facilities, such as cycle parking or dedicated cycle lanes, are needed. Strava, too, sells aggregated ride data to city authorities through its Strava Metro program—but that came as something of an afterthought to its original business of running a leader board for competitive cyclists. Although it started out as a tracker for sport cyclists, in a pitch for the Metro service, Strava says that about half the trips it tracks are regular commutes, not leisure rides. The company’s head start in this market means that the free “heatmaps” it offers on its Strava Labs site already cover far more cities than KappoBike, which has plenty of data around its headquarters in Santiago, Chile, and in a couple of cities in Denmark, but precious little elsewhere. Even after three days of promoting the KappoBike app through the startup competition at LeWeb, only a handful of rides were showing up in the vicinity of the show venue.